And on the seventh day... they decided against resting and kept right on playing! The 2014 World Series of Poker ends its first week today with four more events in action, with the last scheduled day of the huge Event #8: $1,500 Millionaire Maker No-Limit Hold’em likely to draw the most eyes given that huge $1,319,587 first prize up top. VP of Corporate Communications for Caesars and WSOP.com Editor-in-Chief Seth Palansky tweeted over the weekend that a total of 6,226 individuals participated in Event #8, with 1,751 of them buying into both of the Day 1 flights. As Palansky pointed out, that total is up from the 5,044 individuals who played the “Millionaire Maker” last year when it was first introduced at the WSOP, with 1,299 of those having entered twice a year ago to make 6,343 total entries. There are still 178 players alive in this one, all dreaming of being the one to whom the tourney’s title will ultimately apply. Yuliyan Kolev of Sofia, Bulgaria and Jonathan Demmig of Amherst, New York currently share the chip lead with 632,000 apiece, with Chris Demaci, James Mackey, and Curt Kohlberg among the many not far off the leaders’ pace. 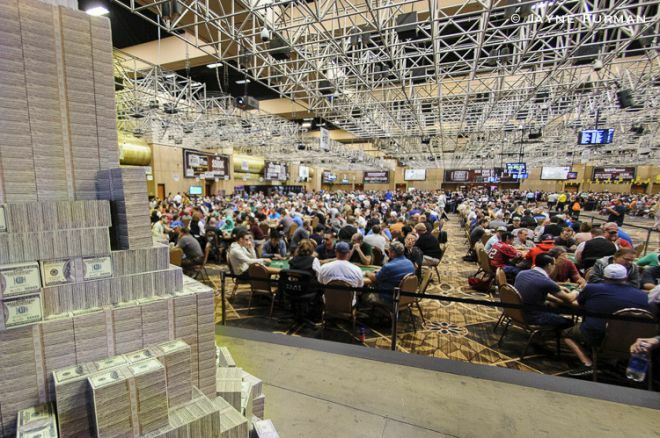 Entering this year’s WSOP, there were 303 players who had earned $1 million or more lifetime in WSOP events. The schedule has this one playing down to a winner tonight, although with so many players still remaining we’ll soon see how quickly things proceed. In any event, it’s very likely the WSOP Millionaires Club will be accepting a new member very soon. They’ll be resuming at 1 p.m. PDT today for Day 3, so start checking the Event #8 live updates then. Starting back alongside the “Millionaire Maker” will be Day 2 of Event #9: $1,000 No-Limit Hold’em in which 161 survived yesterday from a starting of field of 1,940 to return. They’ve already made the cash in Event #9, having begun to divide up the $1,746,000 prize pool on the way to finding out who among the participants will be claiming the bracelet and $323,125 first prize. Adam Geyer currently sits in first position with a big stack of 177,500 that presently puts Geyer well clear of his nearest challengers Ryan Jaconetti (99,700), Chris “Big Huni” Hunichen (99,000), Keven “Stammdogg” Stammen (94,800), and Vinny Pahuja (93,200). Also returning to above average chips today are Mark Radoja, Thiago Nishijima, and Faraz Jaka. Start checking the Event #9 live updates at 1 p.m. Vegas time today to see who among the returners can manage to position themselves for a bracelet run tomorrow. The second of the summer’s many $10K “Championship” events highlighting various poker disciplines, Event #10: $10,000 Limit Omaha High-Low Championship, begins Day 2 today as well with Dan Kelly coming back to a stack of 146,700 and the chip lead among the 111 survivors from the 178 who started yesterday’s first day of play. As to be expected, there are a number of familiar names among the Day 2 counts, with Jeff “yellowsub86” Williams (144,700), Eli Elezra (123,100), Marco Johnson (113,000), Richard Ashby (112,000), and Perry Friedman (100,300) among those near the top of the leaderboard. End day 1 of WSOP $10k Omaha 8 with 99,100. I'm going to win this one. The plays I saw today were "special" to say the least! See how Negreanu fares in his quest for a seventh WSOP bracelet as well as how others do in the Event #10 live updates which will begin when the players do today at 2 p.m. local time. Finally, there’s just one new bracelet event getting started today at the Rio All-Suite Hotel and Casino with Day 1 of Event #11: $1,500 Six-Handed No-Limit Hold’em. A year ago John Beauprez topped a big field of 1,069 to win this event and the $324,764 first prize. Manig Loeser, Joe Cada, and Keven Stammen were also part of that final table. This one kicks off today’s action and coverage, so begin your day of hitting the refresh key over on the Event #11 live updates at noon PDT. Follow all of the action from the 2014 WSOP on our Live Reporting Pages, and stay tuned throughout the summer for plenty more from our What To Watch For series.